Given the advances of the last two decades, HIV is no longer a death sentence for most patients. However, for drug users, especially cocaine users, and hepatitis C- (HCV) infected patients – HIV is still life threatening. This problem is being tackled by a team of experts lead by Robert Stempel College of Public Health & Social Work professor Marianna K. Baum. In 2013, Baum, a dietetics and nutrition professor, found that HIV-infected patients who took inexpensive multivitamins with mineral supplements experienced slower disease progression. Now, she is turning her attention to people with HIV again with a new $5.4 million multiyear National Institutes of Health grant. The study will explore the role of cocaine use in the progression of liver disease in people with HIV. Many of the HIV-infected persons in the United States also have HCV. Cocaine, the most abused drug in South Florida, puts patients at risk for treatment failure, lower adherence to medications, and may have an independent effect on liver disease. HCV-infected people who also have HIV will be studied using noninvasive technology. The team will use magnetic resonance elastography (MRE), a highly accurate method for diagnosing liver disease. Baum has enlisted the help of experts such as: Richard L. Ehman, professor and chairman of the Mayo Clinic, Department of Radiology; Jeffrey Horstmyer, professor and founding chairman of the Herbert Wertheim College of Medicine, Department of Neurology; and Kenneth E. Sherman, professor of medicine and director, University of Cincinnati, Division of Digestive Diseases. The study will leverage the existing Miami Adult Studies on HIV cohort (MASH). The people that make up MASH have been studied by Baum’s research team over the past 12 years, and this new program will expand the size of this study group from 881 participants to 1,500. Unlike many other HIV study groups made up of mostly middle- to high-income homosexual white men, MASH is predominantly comprised of heterosexual Hispanics, African-Americans, women and drug users that do not use needles. “The value of this study is that it will service our community because the MASH cohort will include lower-income minorities,” Baum said. Baum explained that some lower-income individuals may not have a dependable means of transportation to go to the doctor, and for others, cultural stigma may have kept them from going to a doctor for treatment. For these reasons, part of the work will focus on helping participants make and keep their medical appointments, in an effort to overcome health access disparities. “We are grateful to Nora Volkov, director of NIDA, and Jacques Normand, director of AIDS Research, NIDA, for their support, and to J. Khalsa, chief, Medical Consequences Branch at NIDA, for guiding our research efforts that culminated in receiving the resources to follow this unique cohort for the next five years,” said Baum. 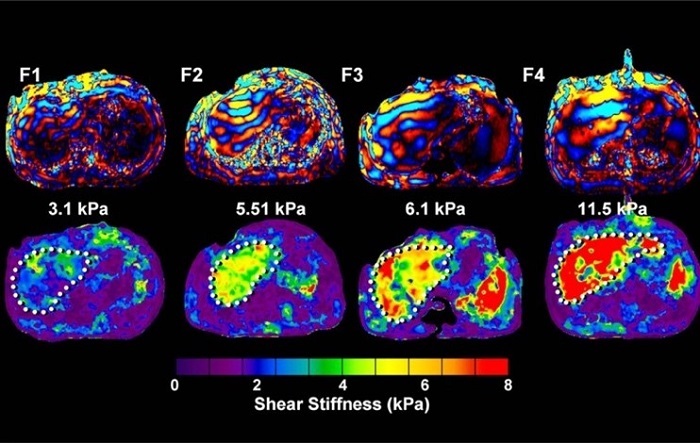 *Image Copyright © 2012 Wiley Periodicals, Inc: Venkatesh, S. K., Yin, M. and Ehman, R. L. (2013), Magnetic resonance elastography of liver: Technique, analysis, and clinical applications. J. Magn. Reson. Imaging, 37: 544–555. doi: 10.1002/jmri.23731.